The Mercedes-Benz CLS Edition Black: Dark Scheme packs a punch and is coated in pure black matte paint. German tuning company Kicherer has kept their take on the Mercedes-Benz CLS simple. The Edition Black truly is its label. Blacked out body - check. Blacked out grilles - check. Blacked out rims - check. Blacked out interior - check. Black matte paint neatly covers the entire chassis, while the vehicle is detailed in carbon fiber painted Mercedes-Benz signature silver. The car gives off a nice but tedious look, and by the time you hit the interior all you see is the monotony of too much of a good thing. Even the built by hand RS-1 20-inch forged wheels (which look amazing standing on their own) are finished with the matte black. The CLS Edition Black really comes alive under the hood. 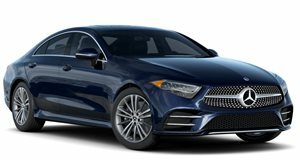 The standard CLS gets 408hp and 443 lb/ft, however thanks to a software update and an all new sports exhaust system, the Edition Black jumps up to an impressive 470hp and 509 lb/ft. The response of the vehicle has also been upgraded with a Kicherer PowerConverter. To control the power-boost, Mercedes&apos; new six and four piston high performance braking system comes complete with compound discs and flexible stainless steel hoses.